This race was really close to the JFK/UMASS stop on Boston’s Red Line, and I live really close to the Quincy Center stop on the same line. This meant that getting to the site would be really, really convenient. Unlike other races, I was able to take my time with coffee and breakfast before heading out. I was even able to dawdle a bit and post a quick morning video. 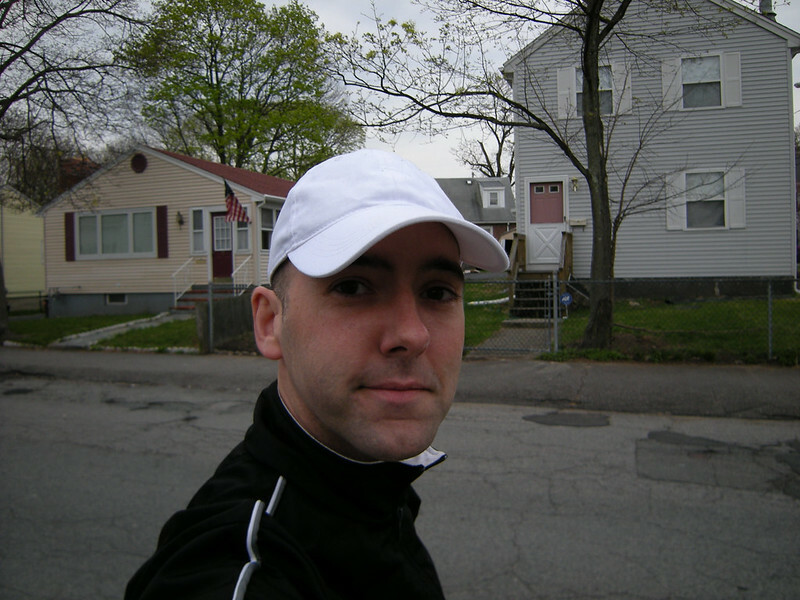 I met a guy named Paul at the train station and we chat while we wandered over to the course. This got me pretty excited, because I’m already fantasizing about having a big crew of friends like I did back home. If I show up for a race in Charleston, I can probably get a dozen people into a cafe for a post-race brunch. I’d like to establish the same kind of thing in Boston. So, once I picked up my packet I started glancing around for Sara. No luck until I got into line for the port-a-potties, when I noticed her maybe five spaces behind me. All roads lead to Rome, I guess. I made a silly face to get her attention and we reconnected after everyone’s business was done. Sara was there with a couple of friends, shown in the photo below. 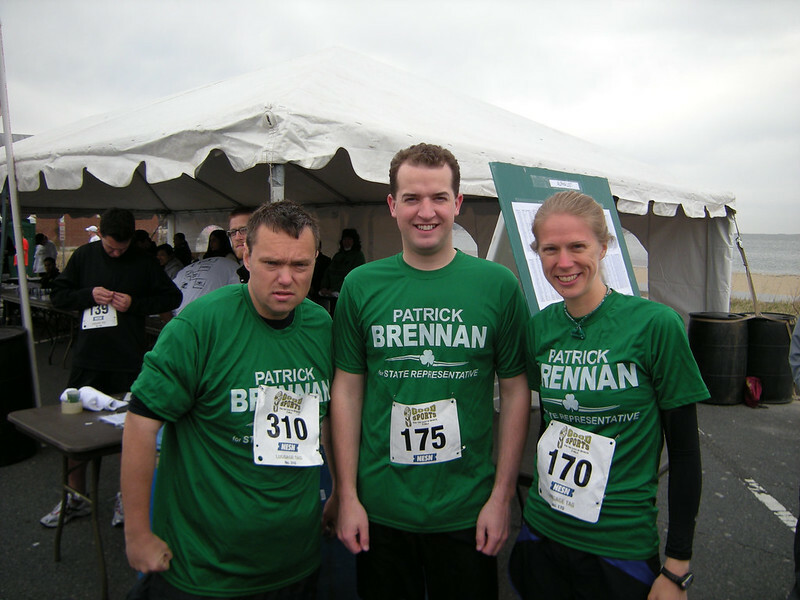 One of them was Patrick Brennan, (tall guy in the center) who’s running for a Representative seat in South Boston. The other is a guy named Brian (no relation) who has lost over 150 pounds… so far. Seriously, this guy is a major success case. I thought I had dropped some weight over the years, but this guy has me beat. He’s not very fast, of course, but that doesn’t tend to bug a guy when he’s getting stronger and stronger all the time. He’s going to watch his race times dwindle like a compulsive gambler’s bank balance. This thing wasn’t actually on the beach itself, but it was pretty close. 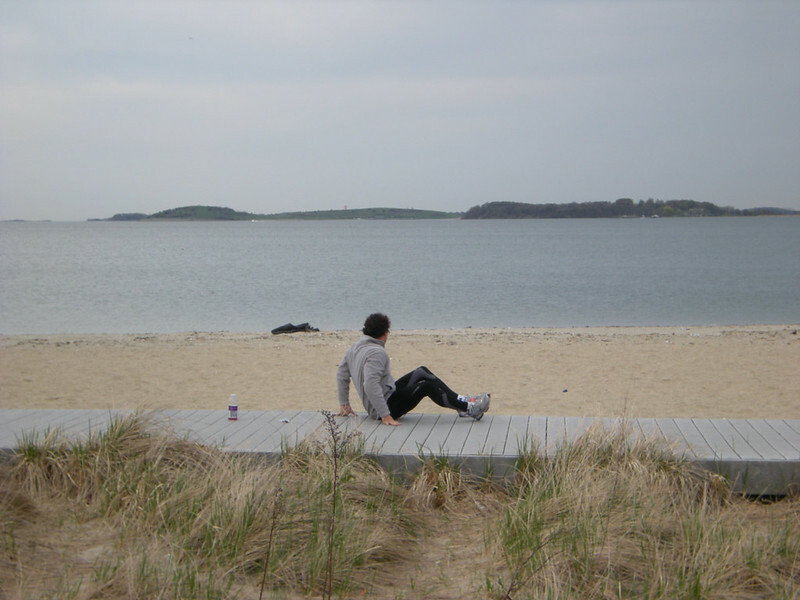 Some folks were taking advantage of the scenery by stretching on the boardwalk, or just running back and forth on the sand. 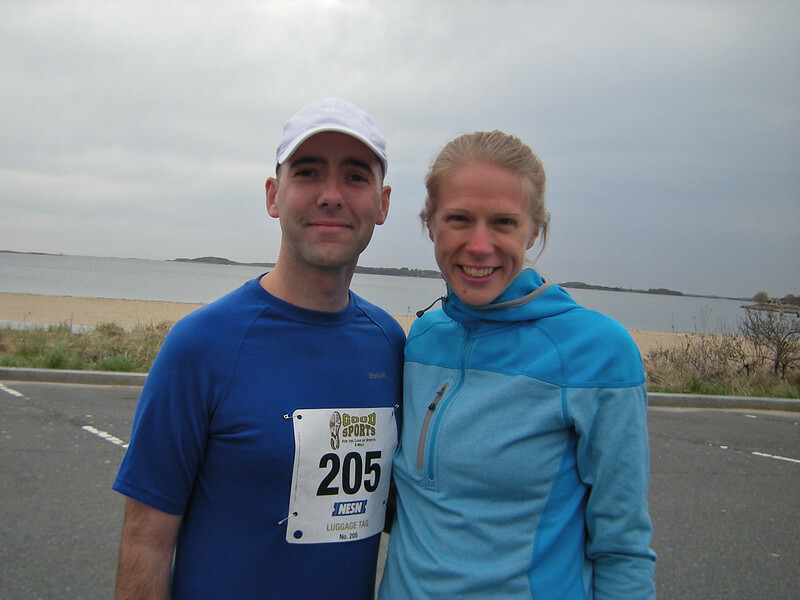 The weather was still a little cold for the beach, but it was just right for a race. The course was an out-and-back kind of deal, with a hook at the end. We ran past the starting line at the end, adding just a little more distance before turning around again and approaching the Line from the other side. This guy wasn’t just relaxing. He was stretching. Or… maybe it was both. I’m not sure why, but I got frisky at the last minute. Instead of taking my camera with me, I just left it with my stuff and ran without. I tend to finish a good bit faster when I’m not slowing down to take pictures of things, so when I set down the camera it’s usually a sign that I’m not playing around that day. I expected Sara to zip ahead of me, so I told her not to worry if I was slow. Just ditch me, it’s cool. She told me not to worry about that because she was only cruising today. She has the Boston Marathon next week and she’s just looking for a fun tapering run. Still, I expected her “cruising” speed to be kind of ridiculous. I mean, the woman trained for a marathon during some of the worst weather this Southern Boy has ever seen. I was convinced that her idea of “slow” would leave fiery trails in the road. Imagine my surprise when I surged ahead and found myself away from the group. Over all, I couldn’t be more pleased with the way today went. I’m making new friends, I scored a new PR (this was my first 5-mile, so technically it’s a record) and the day had warmed up enough to make the train ride home a sunny pleasure. I even got to spend a little quality time with my new book, Changes by Jim Butcher. (It’s a Dresden Files novel, and is therefore awesome.) I’m ready for summer! Bring on the races!